If you live in a pet-friendly household, you’ll know how difficult it can be to keep the place clean. Try as you might, it isn’t long before your beloved pets have made their mark all over your home once again. Hence, when you tackle those inevitable cleaning jobs, you might as well arm yourself with the right tools. 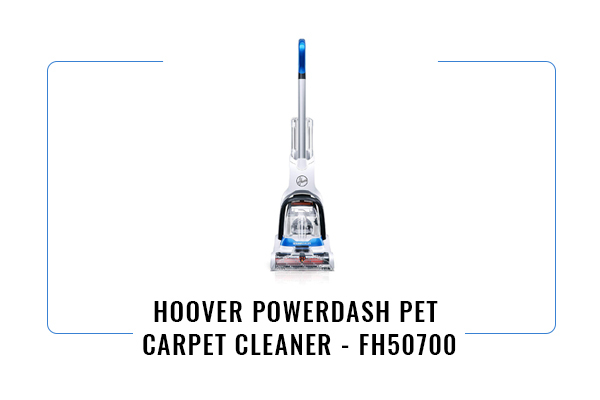 In the case of the Hoover FH50700 PowerDash Pet Carpet Cleaner, you’re looking at a seriously powerful weapon for your arsenal. One of the top-selling uprights of its kind on Amazon right now, the Hoover FH50700 Pet Carpet dustbuster is a powerhouse pet-stain-buster at an incredibly affordable price. Some vacuum cleaners do a decent job of eliminating pet-related stains – others are designed from the ground up with pet-friendly households in mind. The Hoover FH50700 Pet vacuum cleaner being an example of the latter – an impressive machine delivering all-round performance at a price that’s hard to beat. By the end of this review, you’ll want one trust us! It’s worth noting at this stage that the Hoover FH50700 isn’t a vacuum cleaner in the traditional sense. Instead, it’s an all-in-one carpet shampooing, rinsing and drying machine that delivers the ultimate cleaning performance. A pretty impressive list of selling-points – the one exception being a slightly disappointing warranty of just one year. 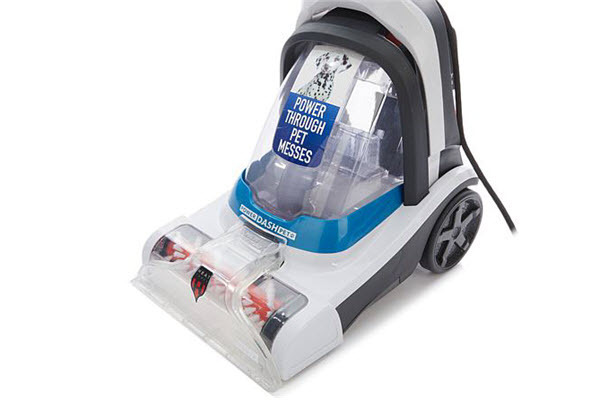 Nevertheless, most Hoover FH50700 Pet Carpet Cleaner reviews submitted by real-life users suggest this thing is built to go the distance, so it’s hardly a deal-breaker. 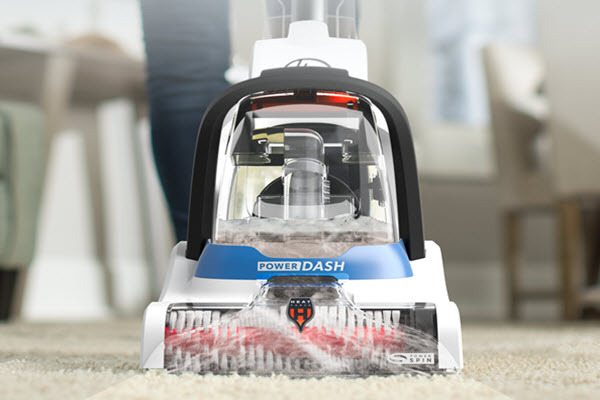 What immediately stands out about the Hoover FH50700 PowerDash Carpet Vacumm Cleaner is its gorgeous compact design. It’s significantly smaller and lighter than a full-sized carpet cleaner, making it far easier to handle and less tiresome to work with. 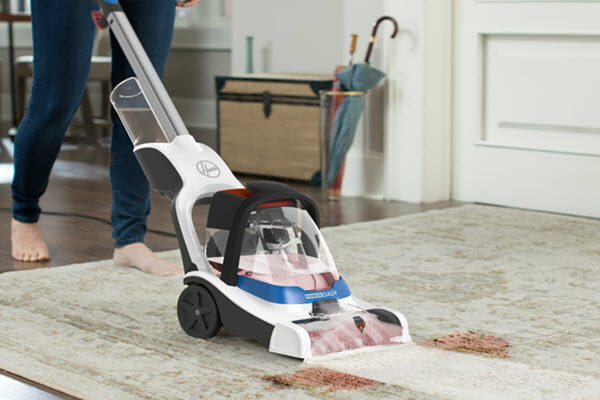 Despite being way smaller than a typical cleaner, this Hoover FH50700 Cleaner has an impressive cleaning action that gets deep into even the thickest carpets. Whether dealing with everyday dust or dried-in fruit juice, a couple of passes and it’s erased from existence. Perhaps even more impressive is the capacity to effectively remove moisture from carpets. Tested on a bunch of different floor coverings, there was a very little residual moisture left behind and no requirement to allow additional drying time. The tank itself is relatively small, so may need to be emptied more often. Nevertheless, this is a small price to pay for a quality compact carpet cleaner that’s incredibly easy to use and comfortable to push around. You could argue that the one slight downside with the Hoover FH50700 Cleaner is the lack of additional extras and accessories. The reason being that it doesn’t ship with any at all. Instead, the Hoover FH50700 Carpet Cleaner has been designed to quickly and easily deal with carpets, rather than tackling soft stair coverings and furnishings elsewhere. There’s no hose, no attachments and nothing extra – just the primary carpet cleaner itself. Back on the positives, the Hoover FH50700 Cleaner somehow manages to get the job done far more quietly and discreetly than some of its closest rivals. There are a couple of ultra-premium carpet cleaners on the market that are even quieter, but not many. And none whatsoever within this price bracket – the Hoover FH50700 PowerDash Carpet Cleaner is standing head and shoulders above the competition. 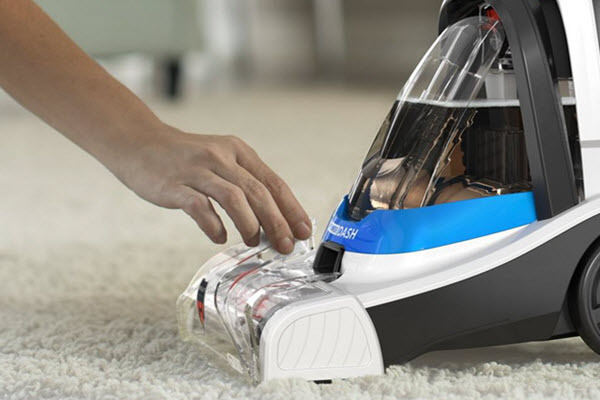 If allergies are an issue, then this Hoover FH50700 Pet Carpet Dustbuster is a machine you need in your life period. There are plenty of decent vacuums that can help eliminate pet-hair and reduce allergens, but don’t do a great deal with the more embedded allergens in your carpets. You can’t see them, but they’re there – millions of them. This Hoover FH50700 Pet Carpet vacuum cleaner has been designed to clean more deeply and thoroughly than any standard vacuum ever could. It’s also incredibly convenient and easy to use, so it’s perfect for pulling out on a regular basis. Use this thing a couple of times each month, and you could notice a huge difference in the freshness of the air around your home – especially if you happen to be an allergy sufferer. In case you can’t already tell, we were (and are) incredibly impressed with the Hoover FH50700 Pet Carpet Cleaner. In terms of simplicity and convenience, it’s hard to think of a better carpet cleaner on the market right now. Certainly, within this price bracket, you won’t find anything that comes close. Of course, you could argue that this Carpet Cleaner would be even better if it came with a bunch of tools and accessories. Which is true, but it would also end up being considerably larger and more expensive. If you simply want a powerful, reliable and affordable machine to tackle your carpets and rugs, this really is it.